The china doll plant is a fairly recent houseplant, having only been introduced since the early 1980s. 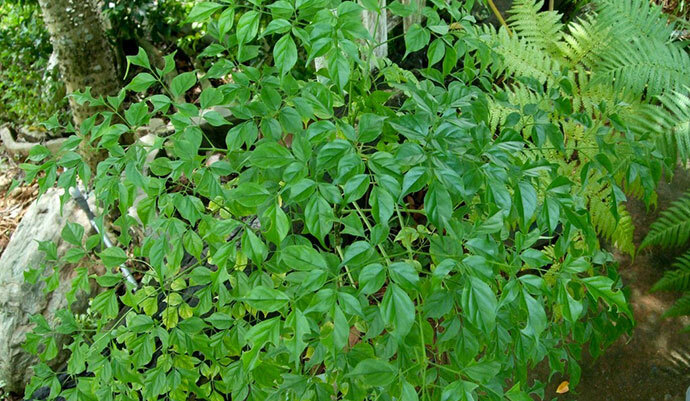 It’s a fairly compact plant that has became very popular due to how tolerant it is of the warm, low-humidity air of most modern homes. It has medium to dark green glossy leaves that almost look a bit oily. The leaves are divided into separate leaflets and are generally thin and delicate looking. The blooms are white (but it rarely blooms in the home). China Dolls prefer to be somewhat root bound, so be really careful about re-potting them. It’s a plant that doesn’t like change very much either and re-potting it, moving it to another area or drafts may cause major leaf loss. Radermachera sinica’s are pretty hardy plants so long as you put them in the right environment to start with. As mentioned above, if you fiddle around with them and move them a lot, they will respond by promptly dying…so avoid this! For best growth, give your china doll plant a lot of bright (but indirect) sun. It needs at least 4-5 hours of sun per day, even indoors. If you don’t have a spot in your house that gets that much light, you should consider purchasing indoor grow lights to supplement. When watering, be careful. Too little or too much can wreak havoc on your china doll plant. The soil should be kept moist, but the roots shouldn’t be allowed to sit in water. Water only when the top inch of the soil is dry to the touch. If your plant develops brittle leaves that turn yellow, it not getting enough water. Too much water is indicated by black colored tips. These compact trees like a rich soil that drains well. General purpose potting soil can be used, add sand or perlite if extra drainage is needed. The china doll plant should be fed at least twice a month while it’s growth period is active. Use a standard 10-10-10- liquid fertilizer that’s diluted by 50%. These plants require less fertilization during inactive growth and feeding times should be decreased. Example of a mature radermachera sinica. While it is difficult to propagate a china doll plant, it isn’t impossible with a little extra care. Cuttings can be taken from the stems, but the cuttings have to be green and not wood like. The cuttings can be planted in small pots that you have filled with some moist compost or potting soil. Covering the pots with plastic will help retain the moisture level. China doll’s need high humidity to take root. The cuttings should be placed in a location with bright, indirect light. Keep the soil evenly moist during this time and within 3-4 weeks the roots should begin to grow. When it comes to scale insects, the best approach to prevention and treatment is a systemic insecticide. This is an insecticide that gets into the plant’s system, so any plant material that scales feed on becomes toxic to them. There are a few fly species that like to attack the China Doll, including fungus gnats. The general treatment for fly infestations is a lower-humidity environment and treatment with beneficial nematodes. Also see my guide on treating and preventing fungus gnats. Q. The leaves of my china doll plant are dry and falling off of the stem. Does it need more water? A. The most likely problem is that you didn’t water enough and that part of your china doll plant has died. You won’t be able to salvage that section, so cut it off and new growth will come back. Q. What are these little white balls on my plant? They kind of look like little cotton balls. A. It’s almost guaranteed that they are mealy bugs, one of the most annoying indoor garden pests. If you’re lucky enough to have only a few, you can remove them with rubbing alcohol and cotton balls. For a larger infestation, use an approved insecticide and spray your entire plant. Q. There are a lot of leaves at the top of my plant, but not many below. What’s happening? A. You’ll want to heavily prune back your china doll plant and then move it to a very sunny location. Pruning at least 2/3 of the plant back is a good rule of thumb here. Q. The leaves are falling off on my china doll plant! What’s happening! A. Whenever you change the amount of light, water, or the temperature in the room, your china doll plants can respond by shedding leaves. It should stabilize once it gets used to the new environment. Q. I’m watering correctly, but my entire plant is drooping. A. You may think that you’re watering correctly, but if you have this problem on your china doll plant chances are good that the roots of the plant are rotted out. Let the soil dry out completely and cut the plant back a bit. 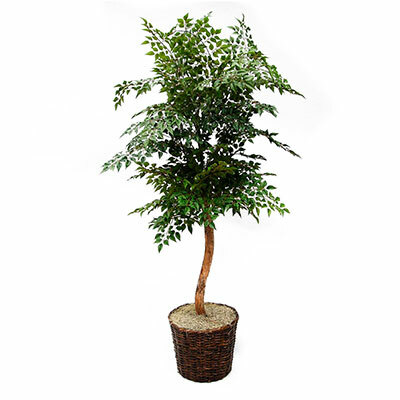 However, it’s hard to come back from rotted roots – you may need to get a new plant. I have 2 6″ diam china dolls. Where can I get a larger one? What geographical area is your mother in? I’m wondering if it’s hardier than claimed to be. Can this plant be made into a bonsai? I think it’s possible, but I’ve never done it myself Mike! Does the plant sweat sap or something sticky? I find my desk covered with a sticky residue which cleans up easy but am concerned about the plant. Plant doing well and about 2′ tall and full in clay pot. If there is a sticky sappy residue, I would inspect your plant in detail for pests like mealybugs or aphids or scale insects. They can secrete some sap-like substances. On the top half of my china doll, the leaves are a much lighter, brighter green. What am a doing to cause this difference in the color of the newer growth? Usually new growth can look lighter and greener before it matures and darkens up…so I’d give it some time. If it remains that way, definitely leave me another comment! Does China doll falling in Winter? Usually it’s less vigorous in the winter time, yes! The china doll plants are airpuryfy plants? Yup, they do purify the air! Great site! Fell in love with my “China Doll” 5 years ago. Its just gorgeous! But I am wondering if I can trim the “roots” back? I am getting into a bigger and bigger pot. Gets any bigger and I won’t be able to lift it. Can I trim roots back in the spring while I trim the branches back? They are a hardy plant and I do not want to kill it. Help! Thanks Gregg! Another thing you could consider is simply not increasing the pot size and let it live in the rootbound pot. Depending on how much you gave it, you could have caused nutrient burn by over-fertilizing. If that’s the case, one way to refresh it is to repot it with fresh soil. You could also water it a few times so the water drains out of the bottom and reduces the concentration of Seasol in the soil. I hope that helps, Cecilia! Hello I’m on my second China doll bc my first didn’t do so hot- my current plant is droopy (the leaves are drying as well) and sad looking I thought it might have been bc I was watering too much so now I’ve been trying to water it all the way through when the soil is dry and spray the leaves everyday with water but nothing has changed right now it’s in my bathroom which gets a lot of sunlight but it’s not doing well still. I live in northern California and the temp is around the 80s to 90s lately… I’m new with plants and I would love help on caring for the china doll bc it’s quite lovely(I’m doing things wrong and it hurts knowing i might lose another :(((( ).. anyone help pleaaase? My indoor China Doll has aphids. How do I treat these without harming the plant? Soapy water spray, dusting your plants with flour, or using neem oil are all good ways to treat. None will harm the plant and you can just wash off flour / residue after treatment. Thank you Kevin. I sprayed the plant with soapy water but I must have used too much soap because most of the leaves fell off. Have to trim the plant now and try to save. As you can see I have a brown thumb but trying to change that. Hey, progress is progress. Now you know one more thing NOT to do! I have close to 20 China Doll trees, and all are grown outdoors. They are grown from the seeds they produce each year for me. We actually have 2 that are over 30 feet in height.Right now we have just collected thousands of seeds to get ready to sell. my indoor china doll looks fairly healthy but has powdery stuff on it. its autumn here. temps about 17 degrees C, can you please help me? on the bench around the plant is dusty looking specs. A China Doll was given to me about 23 yrs ago by co-workers as a get well gift. It seemed to do well for a while then had a suffering spell. I stuck it outside thinking it would have to be tossed, but eveb tho we lived in Huntington Beach CA and the patio was shady it survived. The next house was even more hectic as I had 2 jobs and less time to care for it but it had grown quite bit on the shady patio (not much rain but lots of moist air from the ocean a few blocks away). This continued thru three more moves, in/out, in/out. The last place I hade my son-in-law plant it in the front of the condo, it was about 4 or 5 ft tall. I never thought it would get over 6 or 7 ft tall. We planted it ubder the eaves of the one story house and next thing we know it is curling out & up around the eaves. That ‘Doll’ didn’t stop untill she was well over 20 feet. and the flowers do have a most pleasent scent. How can you tell if one is dead or not? (China Doll) I have had mine for abou 15yrs and now it seems dead. ;-( Any help at all? My china Doll Plant is now above the roof of our house, it is in the front garden, gets early morning sun, then shade for the rest of the day. It has a white flower and has continually flowered since February and the perfume of the flower is very strongly scented. I live on the Mornington Peninsula in Victoria Australia. It also gets very little water, mainly only when it rains. It is a real specimen tree in the garden. I have had a china doll for years, I am in Brisbane Australia, my tree is about 20 ft. tall, in the garden. Every couple of years it gets lopped, and is more lovely each time. It is pretty much in full sun and completely neglected. It only gets watered by the rain. Maria: I water mind twice a day and it’s thriving, but then it is very hot here. When the leaves start to point down, I water it immediately and they perk back up. I don’t think yours is getting enough water. please need i have a green house in my back yard. in sourh texas.i was given 30 china doll plants .can they be planted in the yard. please help soon. I bought a little China Doll plant at the supermarket in a tiny pot. It was supposed to be an indoor plant, but I put it in the back patio, in the shade. The plant had other ideas, though, as it continually leans toward the sunlight, it seems it wants as much sun as it can get! I’ve moved it into the sunshine, and we’re having a hot, dry summer here in Perth, Australia, so I water it every day. The thing is, it doesn’t look like the plant in the picture. It’s just one tall, skinny stem that has shot up like a beanstalk! It started about a foot high 4-5 months ago, and it’s now as tall as I am. It has plenty of leaves coming off the one central stem and is very beautiful. I’ve had to tie it to a stake so it doesn’t fall over. Is this normal? Should it be more of a bush? Should I re-pot it? It’s still in its original little pot. Will it be okay to stay outside when winter comes? Shirley-I got mine at home depot! Shirley – I got mine at walmart. I have been searching for a place to buy a China Doll, but have not been able to find one. Can someone please help me find a source? Shirley, if you have a local flower shop (florist), or plant nursery sometimes if you ask they can order you one. I know on a few occasions I have done this with the nursery in town. Living in Iowa, my china dolls thrive outdoors all summer but must come in during the winter months. They don’t like the change and loose all their leaves. The past 2 years they both lost all their leaves and I cut them off (about 4″ above the soil) the first year, thinking they were dead! I set them back out in the spring to get rid of them and keep the pots and much to my surprise, they grew… and strong and healthy! Same thing happened the next year, losing all the leaves when I brought them in, etc. When they did, I cut them back and they came back again outside. How can I keep them during the winter months inside?? Help soon, as I’ve just brought them in once again! i just received the plant it came from a florist with no instructions. My plant was a gift from my husband’s funeral. It is dropping some leaves. I have it in a north window, it gets good light. I watered it once a week and then drenched it and let it drain. That doesn’t seem to be right because it is starting to drop a quite a few leaves. I thought I would water it a couple times a week and try that. What is the best way to water it ? My plant is doing well, but the stems once matured grow down. Why is that? HELP! I have a china doll that i’ve had for a few months it was good at first and lately a bunch of the leaves have been falling off… dying… most of the plant seems good though… anyways i was just pulling off some of the dead branches/leaves to see that there were HUNDREDS of little almost invisible little bugs walking all over it EVERYWHERE in the dirt part of it. WHAT ARE THESE?!?!??! I put it outside for now… can I leave it out there? How do i get rid of these nasty bugs?!?!? THANK YOU! Try spraying the plant with a mixture of water, garlic and dish washing liquid. The dish washing liquid is basically there to help the water/garlic stick to the leaves. My newly purchased 4′ high China doll is doing very well; although it appears in need of re-potting as it is still in the plastic container it was purchased in. What size pot should I use to repot and what is the best choice in the material of the container. Hi there! I bought my china doll in a tiny 4″ pot about 5 years ago. It is now over 8ft tall and bending up against my ceiling! I have always kept it near but not IN direct sunlight and it has thrived, even times when I was out of town and it lost some leaves I just soaked it and it was fine again. It has adjusted to being re-potted about 3 or 4 times (once because the pot broke). But now I need to prune it back and I have no idea how to. Any advice? Thanks! Guess what! I am an English teacher and found Amy to be right! Her remark was UGLY! The last thing I was looking for was a summer grammar lesson. However, I was happy to read about my China Doll tree. It’s new and I love it. However, I knew very little about it. Another thing for Amy to realize, if you have to apologize for what you are about to say, DON’T SAY IT!!! Hi again…I wanted to update my previous post about my “HUGE” china doll plant/tree that my husband got for me. Over the winter it was dropping leaves and wasn’t looking very healthy. I thought it was a lost cause. I cut back all of the branches that didn’t look healthy and they all re-grew nice bright green healthy looking leaves. The seeds that I planted are still growing, but at a very slow speed. To “Amy”…you are right..your comment is construed as ugly! I’d like to ask you just how “correct” your sentence “..but I happened to read this at the wrong time on the wrong day at the wrong time..” is. Did you read it at two “wrong times” or just one? Amy…this is about plants – not grammar. We’re all from different parts of the country. I am from the midwest. Get used to the languages from different areas and just talk plants. Hey grammer gal that is rude. so u love english some dont care. i know better also but so what can u build a kitchen and paint a portrait ????? I just got a new plant and within a couple days I see little brown eggs on some of the leaves..I look online and see what different bugs look like but don’t see these eggs..what are they? Help! I brought home a China Doll plant that was delivered for my father’s wake/funeral. I read the instructions and watered it often, however, the leaves shriveled up and I’m afraid it has died on me. I’m thinking it had bugs. Isn’t there a spray concoction of water/alcohol that you can spray on the leaves to rid the plant of those pesky things? I have such a hard time keeping plants alive due to bugs!! I have a china Doll Plant that used to be on a decking and was not doing very well, I cut all the branches off and just left the main stem only, I then planted it into the garden where it is now approx 2 1/2 metres high. It has a perfumed white flower and at the moment, it is in bud. It gets morning sun and afternoon shade and is thriving. I live on the Mornington Peninsula in Australia and it obviously likes the sandy soil. Guess what? My grandmother knows a lot about plants and gardening yet she can hardly spell let alone understand proper grammar. Does that mean she doesn’t know what she is talking about? Does that mean she is not intelligent? No it does not. Apologizing for being rude makes it no less rude. This website is about plant care not about grammar but thank you for taking the time out of your day to give us a grammar lesson. I have only to say this one thing, “Indoor Gardner”, and I realize that my comment may be construed as ugly. I’m looking for advice from an INTELLIGENT person, and I cannot believe an intelligent person does not know how to properly use the apostrophe. “Lot’s” as in “lots of” is incorrect…it is lots. “It’s” is incorrect when it comes to ownership. It is “its”. It’s is for “it is”. I apologize for my rudeness, but I happened to read this at the wrong time on the wrong day at the wrong time. This should be basic grammar to someone with basic intelligence. seriously, when did grammar become a requirement for house plant care? Yes. It’s extremely rude to comment on other people’s writing, you have no idea of their education in English. Skills in written language are clearly not an indication of intelligence. You can’t say ‘to properly use’ either it is a split infinitive, a cardinal sin in ENGLISH GRAMMAR, and you’ve just committed that sin, so you are not so educated either.!!! Carol your comment is encouraging. Please tell me will I have that results in Northern California. If your in Calif. I will buy a greenhouse in hopes of the same results. I have had two China Doll plants. They do fine for about a year and all of sudden start dropping their leaves a lot. What could be wrong? Thank you Terri, I really appreciate that a lot!